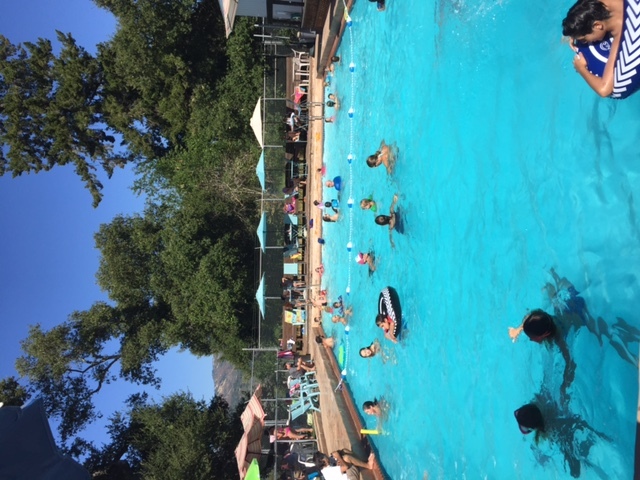 The Redwood Estates swimming pool was constructed in 1929 and is enjoyed by the residents of Redwood Estates. 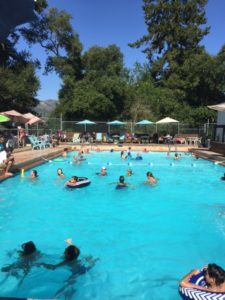 Set against the beautiful backdrop of the Santa Cruz Mountains, it is a great place to get together with friends to enjoy a refreshing swim on a hot day. The onsite Snack Shack offers a variety of snacks and beverages. Certified lifeguards are on duty at all times. Monday to Friday noon to 7:00 p.m.
Saturday and Sunday noon to 6:00 p.m.
Wednesday and Friday 3:00 to 6:00 p.m.
Saturday and Sunday noon to 7:00 p.m.
*Weather permitting: If the temperature is less than 70 degrees, misty, or rainy, then the pool may be closed. As a member of Redwood Estates, you and your family may enjoy our community’s swimming pool. We ask that you fill out and initial the Members Pool Card (kept on file at the pool) with emergency contact information. The following is designed to make all members and their guests aware of the safety rules to be followed at the Redwood Estates Pool. Members must be in good standing (less than 31 days delinquent with any monies due to the RESA Corporation) in order to utilize the pool. Members must accompany their guests at the pool at all times. NO GROUP FUNCTIONS – this includes birthday parties, Girl or Boy Scout events, home and school club meetings, and so on. Children aged 5 and under must be accompanied by an adult 18 years of age or older. If the adult is not the parent or legal guardian, they must have written permission from the parent. Children aged 6 to 9 must be accompanied either by an adult or by a guardian aged 14 years or older, with written permission from the parent. Children aged 10 or older are required to pass a swimming ability test given by the lifeguard in order to remain at the pool unaccompanied by an adult. All users of the pool are to sign in/out daily on the clipboard at the Snack Shack. The above rules are enforced by RESA’s lifeguards and RESA staff members, who have the authority to suspend pool privileges. The Pool Project is still awaiting permits from the County of Santa Clara for our poolhouse remodel. Originally developed in the early to mid 1900s, the Redwood Estates playgrounds have been renovated for safety reasons. With significant funding from FIRST 5, the Western Region of Santa Clara County, and in collaboration with RESA, these playgrounds were completed in August 2007. The playgrounds have been a labor of love by many individuals across the Santa Cruz Mountains. Several people have devoted extensive personal time to help design, negotiate, develop, and implement these playgrounds. The principal goal is to provide settings that can be shared by our community members and more important, provide places for our children to play, imagine, and socialize. Particular attention has been given to providing playground equipment for children of young ages and an inclusive environment for children with special needs. Located on Madrone Drive, next to the pool and across the street from the CDF Fire Station. To rent the field at Friendship Park, please contact the RESA office at 408 353 1866. Located at the corner of Bayview Drive and Summit Road.